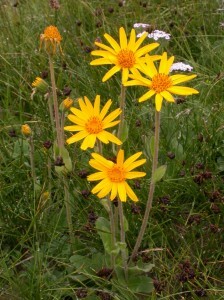 Arnica is a valuable external treatment for bruises and sprains as it improves the local blood supply and speeds healing. It increases the rate of absorption of internal bleeding. We use it with great success along with other herbs in our bruise away compound. The only current recommended internal use is as a homeopathic remedy for shock, injury, or pain. Previously, it was used in the treatment of angina and a weak or failing heart. It is rarely used for this anymore because of the risk of toxicity. Herbalists worldwide have found it effective in treating wounds, hemorrhoids, bruises, toothache, sore muscles, bronchitis, stomachache, diarrhea, and menstrual cramps. (Note that these are external uses.) This is why it is the primary ingredient in our bruise away oil. It comes in handy on the farm as bruises or minor injuries are bound to occur. We never use it on broken skin as we don’t want arnica to enter the bloodstream. It’s also good to wash your hands after use to avoid contact with your eyes or mouth. The healing power of this herb can’t be overstated. In Russian folk medicine, it is used to treat uterine hemorrhaging, myocarditis, arteriosclerosis, angina, exhaustion, cardiac insufficiency, sprains, contusions, and hair loss from psychological causes. View Items Containing Arnica at Cloverleaf Farm.